July 5, 2017 was a momentous day for the Mahindra Group as it celebrated a unique milestone. 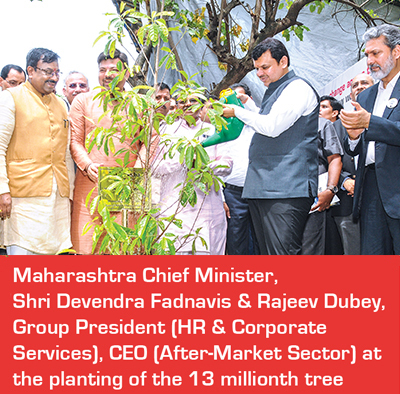 The Chief Minister of Maharashtra, Devendra Fadnavis, Forest Minister, Sudhir Mungantiwar and Anand Mahindra, Chairman, Mahindra Group came together to plant a Rudraksha sapling at the Adya Shankaracharya Garden in Worli, Mumbai. This was the 13 millionth sapling planted under the Mahindra Hariyali programme. Launched on October 2, 2007, the Group’s 62nd Founders’ Day, the aim of the programme is to add 1 million trees to India’s green cover every year. Mahindra Hariyali has gained the momentum of a movement with employees as well as other stakeholders like customers, vendors and dealers undertaking tree plantation drives across the country, ensuring that the annual goal of 1 million trees has often been surpassed over the past decade. Over the years, Mahindra Hariyali has not only touched the lives of countless volunteers across the Mahindra eco-system, but has also helped transform the lives of those most in need. 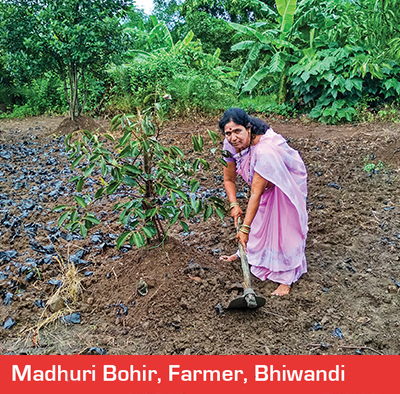 Like Madhuri Bohir, a farmer from Bhiwandi who was solely dependent on traditional farming techniques for survival and livelihood. Along with her family, she lived in constant uncertainty and poverty as apart from a single paddy crop, there was very little cultivation or plantation that took place during the year. But their difficult times have changed – for the better. Today, not just Madhuri and her family but her entire village has prospered. Thanks to Mahindra’s Hariyali programme which introduced the concept of planting saplings and nurturing them into fruit bearing trees, the village community now have an alternate source of livelihood. The programme has, thus, also helped its beneficiaries nurture their entrepreneurial skills. Mahindra employees, through this unique programme, have helped farmers in several districts across India plant saplings like papaya, guava, turmeric, pumpkin, mango, custard apple, amla, jamun, etc. These saplings have a history of high survival rates as well as economic benefits and villagers in districts such as Kasara and Shahapur in Maharashtra have reaped the benefits of this unique project with 1,000 fruit bearing saplings recording a survival rate as high as 83.5%. The success of the initial year – when plantation targets were surpassed by 22% led to a further commitment by Mahindra to plant and nurture one million trees every year. 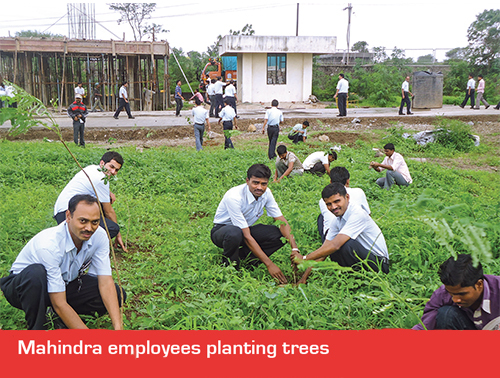 Tree plantation is carried out by employees, their families, Mahindra dealers and associates. Strong and meaningful partnerships with various stakeholders in civil society and Government have ensured proper plantation and nurturing of these trees. To date, over 130 lakh (13 million) trees have been planted across the country with a 75% survival rate. Mahindra, along with its implementation partner, the Naandi Foundation, has enhanced the livelihood of the community and improved the biodiversity of the Araku Valley. 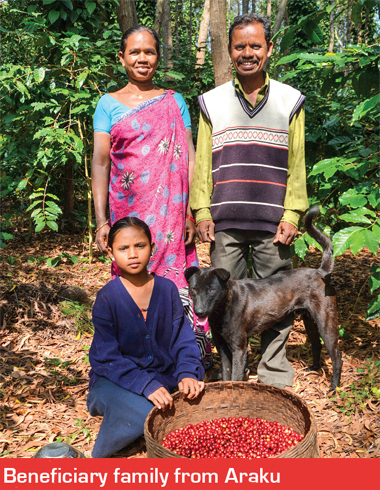 The tribal folk living in Araku have long lost the harmonious and mutually supportive relationship that they had with the forest, resulting in severe depletion of both their nutrition and livelihood. This is due to a complex set of reasons including deforestation, increasing mono-cropping, dependence on subsidised grain from the Government, lack of access to mainstream livelihood opportunities and the threat of large-scale mining. The overall goal of the project is to provide the farmers with a sustainable livelihood. In the Vidarbha region, the project has aimed to create a comprehensive agrarian solution that will deliver sustainable local nutritional security and assured prosperity to farmer families of the region. Wardha district, about 100 km from Nagpur in Maharashtra, is situated at the heart of Vidharbha and a combination of factors, including excessive dependence on cash crops, volatile markets, uncertain monsoons and almost no form of irrigation have all resulted in farmer families in this region facing acute distress. Till date, 4.4 lakh (0.44 million) trees have been planted in Wardha, offering some succour to the agricultural community in the region. To ensure the success of the Hariyali Project, survival rates are monitored and saplings are replaced as and when required, thus ensuring that the project endures for years to come. From 1,120,018 trees planted in 2007, the Mahindra Group has planted 13,393,461 trees (as of March 31, 2017). Of these, the survival rate is as high as 10 million. Today, there is one Hariyali tree for every 100 people in India and the Hariyali tribe has 3.6 times the total amount of trees in Mumbai, including those at the Aarey Colony, a clear validation of the success of this endeavour.